Jean Henri Gaston Giraud. I had stared at my Heavy Metal issue with Arzach in it till it wilted to pieces. "The Long Tomorrow" started to yield more of the city, around corners that he didn't show, and I knew those streets were fantastical at every turn. I studied how thick the line weights were on that story versus the ones on "The Airtight Garage." I was obsessed as I've never been obsessed and will not be again since. I met him when my friend Sylvain Despretz introduced me to him in the early 90's during a Comic-con. We had a sushi lunch. I think I ate. I didn't say anything coherent but succeeded in sounding like every bit of fan boy that I was. The next times I meet him again I could not know (nor was it important) if he recognized me. I worked on doing character designs for an animated Airtight Garage project being produced in Russia. 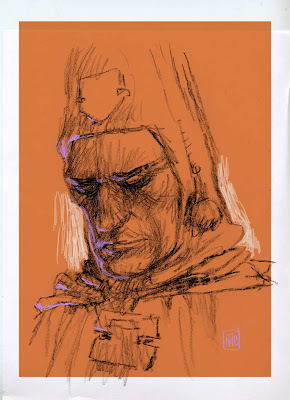 The designs they did had tried to replicate the complicated hatching of a Moebius drawing. No good for animation and a dead give away that the production they hired did not know what they were doing. I did a pass on the main characters, did turns and some head shots. Preliminary stuff, things I learned from Stephan Martiniere who had mentored me when we worked on a DIC t.v. show. As payment Jean Marc Lofficier gestured me to a flat file, "Go pick one." I didn't quite understand what our agreement was as I stood there. Money was not going to be exchanged--? Oh, I get it! Opening the flat file I see all sizes of art and comic book pages (bandes dessinée, real big). I gawk as I touch each gingerly. Overload. I tried for an hour. I came to about a handful that I can't remember now. But I chose finally. A page from the Incal. 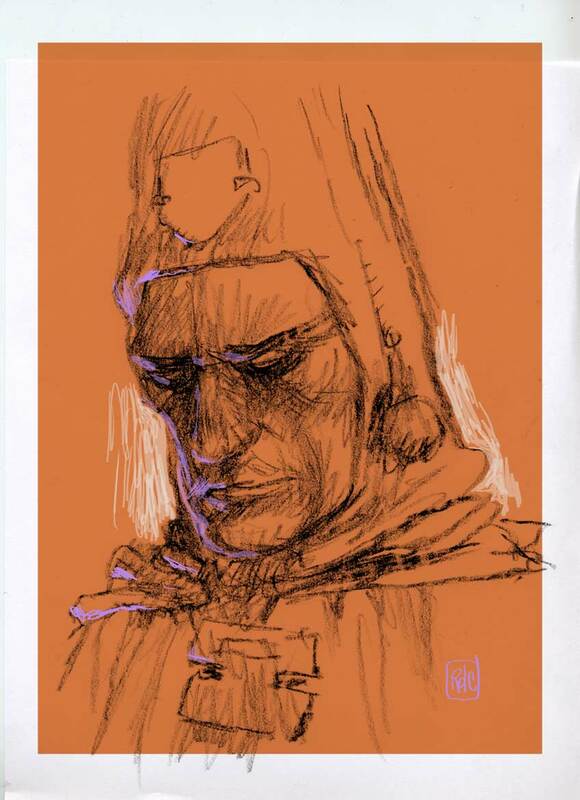 More than the privilege of owning the piece and having worked on a Moebius project no matter how obscure and doomed, I am honored to have met him and somehow intersected with a great artist and visionary. One who cannot be replaced and will not happen on to this plane again. Image was drawn at Cato's Ale House with the crayons they provide patrons. Mostly to kids of families dining there. Drawn in the dark on their graffiti etched table on common bond paper. Post color in Photoshop.